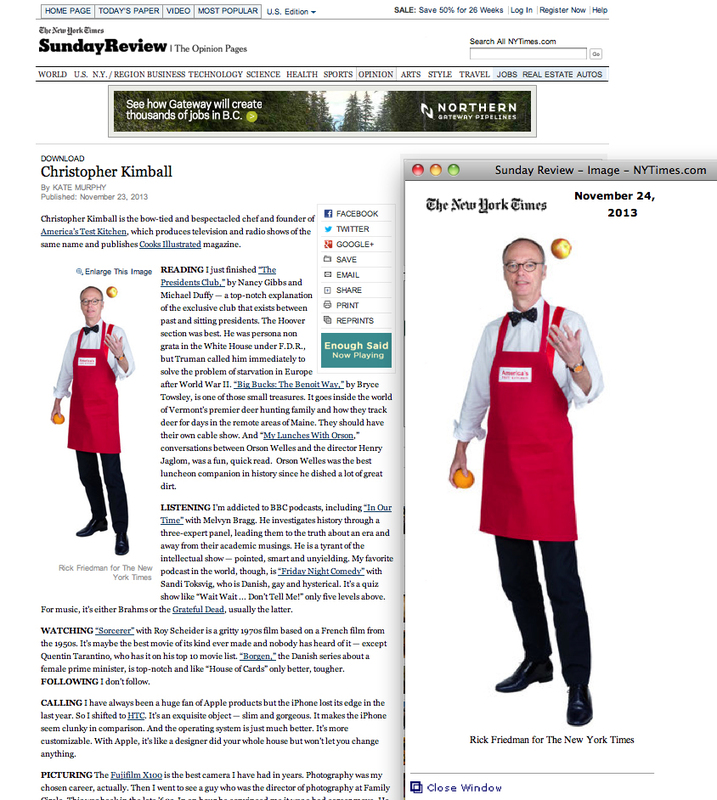 On a recent assignment to photograph Christopher Kimball, host of America’s Test Kitchen for The New York Times Sunday Review, I ran into an interesting challenge. The requirement for the assignment was a full length portrait on a white background. The problem was there was almost no place to put the backdrop in Kimball’s test kitchen. I ended up setting up the backdrop behind some of counters and then rolled out the backdrop between 2 other counters and had to cut it to fit in the isle. I just barely had enough room to make it work. To light the image I used a Dynalite Roadmax 800 power supply with 2 heads. The main light was a Chimera 36x48 Medium Lightbank, on the right side of the camera. 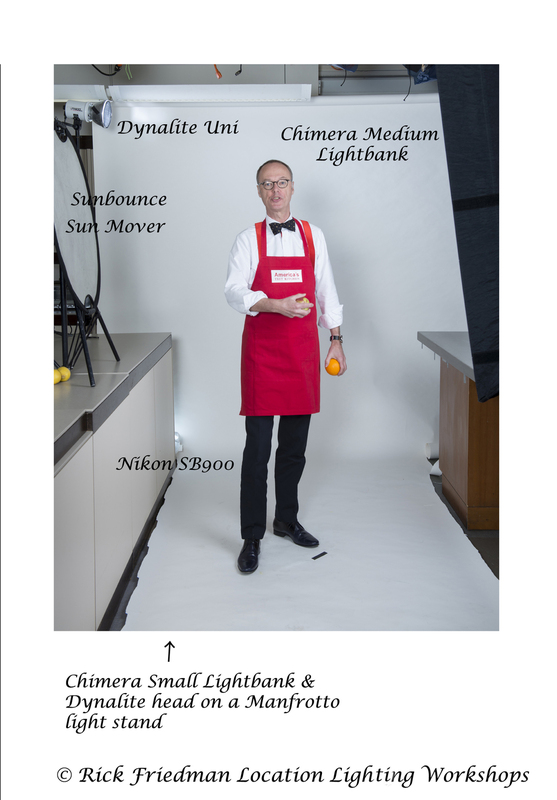 The fill light was a Chimera 24x32 Small Lightbank, placed above the camera and slightly to the left. The hairline light was a Dynalite Uni-400 strobe with a 20 degree grid spot. To help eliminate the shadow on the backdrop, I placed a Nikon SB-900 strobe on the floor shooting back at Chris’s feet. All the strobes were fired with Pocket Wizard Plus III’s. The reflector, a Sunbounce Sun Mover ended up on a light stand on the counter, because there was so little space. The other challenge was the set up and shoot had to be completed in 45 minutes. This photographs was shot with Nikon D800 and 24-70, F2.8 Nikon lens. Just throw an apple and an orange and you have the photograph.